I discovered Margaret Merrilees, a writer from Adelaide, when Wakefield Press published her first novel, The First Week. This novel really impressed me (see my review) partly because it was such an authentic portrait of an older woman whose quiet life is shattered by the actions of her adult son. Her world is destroyed and her search for meaning in what he has done takes her on a journey of discovery which is painful and confronting. It was a serious book about serious issues and I thought it was a fine debut. 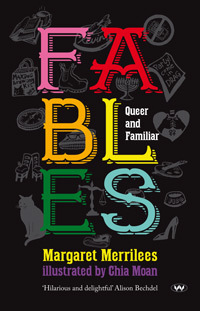 Demonstrating her versatility as a writer with aplomb, Merrilees followed up with the quixotic Fables, Queer and Familiar. It’s a light-hearted look at the urban lives of a couple of lesbian grannies in Adelaide. The book started life as the online serial ‘Adelaide Days’, which is broadcast by Radio Adelaide, and consists of short episodes linked together to form a novella of sorts. It’s a slim book, only 159 pages, and I romped through it in no time. [At Adelaide Writers Week] They turn their attention to the literary luminary who provided the closing address, a wide-ranging multi-disciplinary survey of Europeans in Australia. Julia sprawls on a tarp with her legs stretched and her back against a log. She is filled with contentment, a relaxation rare for her. With enormous fondness she watches the women perched around the fire. Most of them she has known for thirty years or more, though some she rarely sees. They are the women with whom she shared her heady twenties and thirties, a powerful link. They have camped and tramped and campaigned together; shared houses, desert, women’s land, lovers, adventures, ideas and meals beyond count. Profound experiences and ludicrous experiences. On one glorious night they shared the biggest-ever collective fit of the giggles at a packed screening of a dire lesbian film. Some of the political commentary will date very quickly, but I’m impressed by an author who dares to take on so many contemporary issues and express values that matter. (The only other author with the courage to do this recently that comes to mind is John A Scott in his brilliant novel N.) And I enjoyed the comic approach to the serious stuff. (Did I mention there are cartoons?) As with Charlie Pickering’s satire on The Weekly we can chuckle over things the important issues of the day while not losing sight of how they matter. What is it about SA women activists and camping? (eg. Here where we live, Willanski) and is there anyone who would admit to preferring Rudd over Gillard? He is the most “formerly popular” politician I can think of. I don’t think there’s any need to go on bagging him; even Tony Abbott doesn’t get treated as shamefully as the man who made the Apology to the Stolen Generations, averted the worst effects of the GFC and built infrastructure for schools all over the country.